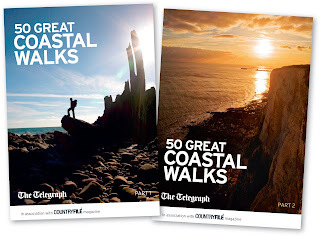 We didn't get much advanced warning about this, but in this weekend's The Telegraph newspaper there are two 48-page walking guides - that's the 19 and 20th May. The guides have been produced in association with Countryfile Magazine, and are introduced by BBC TWO "Coast"'s Alice Roberts. For the price of two newspapers, you get two 48-page, glossy walking guides to help you explore Britain's beautiful coastline - sound's a good buy! John Lennon once sang "a working class hero is something to be".
" BENNY ROTHMAN IN HIS OWN WORDS"
Producer Will Scally, who interviewed and filmed Rothman at home in the mid 1980's, explained that "this interview has never been seen and has created a lot of interest from not just ramblers but social historians. He speaks about many issues and the people that he came up against, this was against a very turbulent backdrop" Benny Rothman led the Kinder Scout Mass Trespass of 1932, the first significant event in the movement demanding public access to the countryside; within three years it had inspired the formation of the Ramblers' Association. This became known as the mass trespass of Kinder Scout and was an act of willful trespass by the ramblers. It took place at Kinder Scout, in the Peak District of Derbyshire on April 24th. On that day a small crowd was expected to join in, but what took place surprised many, the small expected crowd became a 500- strong ramblers army.Two hundred police failed to stop them from surging on to the broad shoulder of Kinder Scout, now one of the park's most visited glories. The trespass proceeded via William Clough to the plateau of Kinder Scout, where they were met by the gamekeepers, violent scuffles and brief fights took place and a drunken gamekeeper suffered a broken ankle. They reached their destination and met with another group. On the return, five of the group along with Rothman were arrested and others detained. Rothman just turned twenty-one was up on charges of riotous assembly and assault. He soon prepared notes of what he was going to say to the jury. He wanted to make a case, he said, for the right to go walking in the countryside. Trespass was not a criminal offence, but they would receive prison sentences of two to six months for offences relating to violence against the gamekeepers. The mass trespass marked the beginning of a media campaign by The Ramblers Association, culminating in the Countryside and Rights of Way Act 2000, which legislates rights to walk on mapped access land. Just how much was against him purely because of his Jewish background and being an active member of the Communist Party? This year has been the 80th anniversary of Kinder Scout Mass Trespass. "The Manchester Rambler - Benny Rothman "In His Own Words" DVD has made a timely appearance and should not be missed. Benny Rothman died in 2002 aged 90 - his legacy lives on .